Written by Jordan Mechner, revisions by Jeffrey Nachmanoff. This is the script for the film based on a video game that Jerry Bruckheimer is going to produce with Michael Bay directing. As many of you will remember if you've read this blog regularly, I posted about the review of the script for POP that "latinoreview.com" did a week or so ago. This is going to be an EPIC movie. Think of it as "Gladiator" set in the world of "1001 Arabian Nights" with a little of the time travel from "Back to the Future" thrown in. Michael Bay has the Herculean task of casting, filming and completing this Arabian adventure in less than two years. We should be hearing about casting soon if this one is to meet its release date. 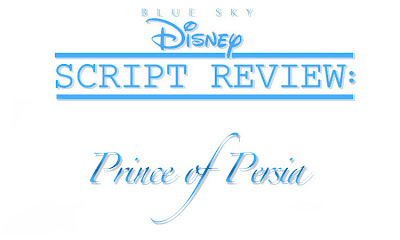 Prince of Persia: The Sands of Time is the story of Dastan, a twenty-something handsome Prince of a large Persian empire during the 9th century. Dastan is noble and wise for his age. His ambition is to make something of himself so that he may honor his father. In otherwords, he wants glory, not gold. He has three Prince brothers: Farhad and Farhan, two older twins who are politically conniving out for treasure and power and the oldest, wise brother named Tus, the heir to the throne of their father, King Shahraman. And then there is Nizam the Royal Adviser... a very "Jafar-like" role. Anyway as you know if you've read the "Latino Review" article... the story starts with a huge Persian army and the introduction of Dastan. His intro is very much like Indiana Jones in Raiders where we see him from behind as we focus on the others around him. He's waging a gambling game with some of the warriors. These warriors don't yet know he's a Prince. We're shown in these scenes the character of Dastan and he is no typical pampered prince. The story establishes there have been a great many battles waged and we see them torturing a prisoner to find out how their enemy is getting weapons. Listening to the pleading screams of the prisoner, Nizam tells the Prince what he interpreted during the interrogation. The ancient city of Alamut has been supplying weapons to the enemy. A huge battle takes place as the army lays siege to Alamut. This is the part of the story where Latinoreview talked about the Parkour fight, which was a great scene, but from his description I expected more. It's here that we are introduced to the female lead, Princess Tamina, a lovely vision of beauty and intelligence. Think of her as an Arabian Princess Leia. As the city falls she hides as a slave girl. There's a scene with a fight between Dastan and a guard where he(Dastan) accidentally kills the guard and finds a beautiful dagger on him. Tamina sees him with the dagger and takes him for a common thief. She plots to get the dagger back... why? We don't know but obviously it holds some power... why else would she want it so badly? As they are leaving the city, Tus decides to stay behind and find the hidden weapons that Alamut has been giving to their enemies. The three other brothers head back to greet their father the King and tell him of their victory. At the King's palace, a grand banquet is being held in his honor. His guest(all male) are gathered in a grand room. It's here that Dastan sees the attractive Tamina, captive and forced to serve food to the gathering. He flirts with her, thinking she is but a beautiiful slave-girl. Dastan brings the King a present, a beautiful robe. Touched, his father tries it on. We can see that the King has a special relationship with his father. Something happens, smoke begins seeping from the robe. The King is starting to feel hot and then screams as the robe attaches itself to the his body, literally burning him to death. Everyone immediately thinks Dastan has killed his father and arrest him. Confused at what has happened, Dastan breaks free and flees. As he's trying to get out of the palace he winds up coming face to face with the slave-girl Tamina again who helps him escape. Hiding and on the lamb, Dastan plots a way to find out who's responsible for killing his father. 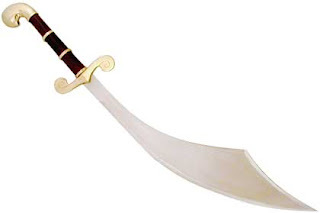 It's while with Tamina that Dastan discovers the power of the dagger. It literally bends time and goes backwards, all the while the person holding it notices what's going on. Traveling with a large group of Gypsies that they've hooked up with Dastan and a distrusting Tamina attempt to get back to the city of Alamut. Dastan must confront his brother, clear his name and avenge his father. We just passed the halfway point... about 80 pages into a 128 page script. The story is quite epic as you've read if you took a look at Latinoreview's synopsis of it. It's a fun read. A grand adventure, I imagine this will be a great summer tent pole for Walt Disney Pictures. The characters are well rounded and fully dimensional. And although it's nothing we haven't seen before, with the right actors it could be a great film. I pictured Adrian Grenier from "Entourage" as Dastan. He would be perfect casting. If Salma Hayek or Penelope Cruz were about ten years younger either one could play Tamina, but it'll have to go to some new Hollywood actress... how about Rosario Dawson or Aishwarya Rai? I was half worried about a scene with a giant hour glass which is part of the game apparently. It works, I'm curious to see how Bay and Bruckheimer pull this one off. I don't know what revisions have been made to the script I have... Hollywood always likes to have revisions. How else is a Suit going to lay claim to a movie if it's a hit? All in all a very good read. Although I must admit that I read "The Mummy 3" script last year and enjoyed it much more. Which makes me curious to see what Alfred Gough and Miles Millar are doing with the script for the "Jungle Cruise" movie. But all that said, "Prince of Persia: The Sands of Time" should be a great popcorn movie. With Bruckheimer at the top of his game and Michael Bay providing direction this could be the start of Disney's next big franchise. Sounds great! Looks like Disney is making some cool movies over the next few years. I like your suggestion of Adrian Grenier from Entourage. He's good looking, really talented. I could see him as an Arabian Prince. When does this come out again? 2008 or 2009?